We appreciate you visiting Deckstainhelp.com as we continue to be your go-to source for the latest in deck restoration news and trending topics through 2019. Below, we talk about Deck Stain Application Instructions. Feel free to leave a comment below with any pictures you may have. There are many factors to consider when applying a stain to a wooden deck. The methods can vary slightly but there are some critical steps and tips that can help in getting professional like results. The type and brand of deck stain you use will obviously affect the outcome. Some deck stains are harder to apply while others are more user-friendly and geared towards the do-it-yourselfer. By doing some research you can choose a deck stain that is easy to apply and leaves little to no overlap marks. 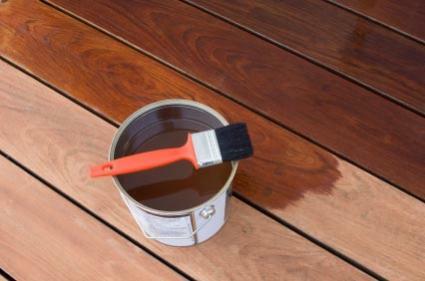 Water-based stains typically dry more quickly and leave more overlap and brush marks than a slower drying oil based deck stain that would apply more evenly. When applying deck stain, it is best to work in small areas. A great method is to stain only one or two boards at a time. Start with one board and coat it as far as it spans across the deck before jumping back and starting on the next one. This helps eliminate lap marks and provides a much evener coat. When applying deck stain with a sprayer or roller, you do not always get the most even look. Go back after you have stained a small area and back brush the stain with a good stain brush. This will even out the deck stain and give you a more professional looking appearance. Be careful not to over apply the deck stain. Not only can this give you an inconsistent look, but it can also cause drying and curing problems. Once the wood stain has had a chance to soak in, back brush or use a stain rag to wipe any excess wood stain that might have dripped or left a puddle. Following these tips for applying a deck stain evenly can be a little more time consuming, but the extra effort will certainly give you a more even deck stain finish and better results in the end. We stained our deck three years ago with Cabot semi solid cordovan stain. The deck gets full sun all day so this year it’s time to reapply. We are going to use the same stain and color. My question is do we need to remove the stain with a pressure washer to the bare wood, or is it simply just using a cleaner? Looking for guidance what to do prior to reapplying the same stain. Use a clean and pressure washer for prep. You do not need to remove it down to the bare wood. In your application instructions you talk about back brushing the stain. But in the articles discussing the Armstrong Clark product, some people indicated the stain remained sticky and you said it was because they had back brushed. How can I apply this stain, which from your discussion seems the best bet for my new cedar kiln dried decking, without the stickiness issue? They back wiped. Not back brush. Back brushing does not remove stain but ensures a more even appearance. Back wiping with rags after say 45 minutes can remove the curing oils, creating the issue of being sticky in some cases. I am applying the water based stain to tigerwood which I have stripped and brightened. How should I apply it, with a rave like mentioned above and then wipe it off with another clean rag? I am a bit confused on how to apply it. How to apply and any need to back wipe varies based on the stain brand you are using. Have you decided on this? For exotic woods like Tigerwood, just apply one coat evenly. Do no back wipe. Use a stain pad or brush. Post a picture when done! what is the lowest temperature to apply the DeckScapes product for best adherence ? 1) If I apply the stain during the day (temp above 45F), how long does it take to dry/cure? I'm thinking the weather at night these days is approaching 45F. 2) What do you recommend for application of Defy Extreme? I'm a little lost with choices of sprayer and brush or foam or….??? Have also looked online for a scrub brush to use with a sprayer (I can borrow one from someone who did their deck), but can't seem to find anything decent. 3) With the deck having been installed in August 2012 and now being in October 2013… Do you think I should stain now since I have everything, or wait until after winter, and stain in the spring? 1. Defy usually dries in 2-4 hours. 2. Stain pad applicator pads. Shurline or Padco brand. 3. Either way would be fine. How many days can elapse between cleaning and staining? After a number of weeks do I have to clean again? Running into rain during last few weeks. 1-2 weeks is normal. If longer you may need to lightly re-clean the wood. How long should a deck dry after cleaning before applying AC transparent stain? Jules, 48 hours is normal. My husband is insisting that our deck and wood rails be stained by applying the stain WITH a rag and wiping off WITH a rag (rather than using a brush at all). Is this normal? or is this a big waste of time instead of just using a brush? Rosie, sounds like a possible case of spontaneous combustion with the rags! Certain wood types to need to be back wiped to remove excess stain. This is for Exotic Hardwoods such as IPE. Hello, I live in Minneapolis MN and need some advice on my deck. It is a cedar deck. Two years ago I sanded it and put on a Cabot Timer Oil stain. It peeled the following year so I did a deck cleaner and then applied another coat. This year it peeled again. Last weekend I put a deck cleaner on (Cabot and Olympic) and my deck looks like crap. I know that I am going to have to sand it again but what are the next steps, what is a good timeline and what is a good stain. I do not want to sand my deck every other year. I have read that after I sand I need to do another cleaner, then brighten then wait and then stain. I have also talked to other people and they say to just sand and then stain as they've never heard of a deck brightener. Also, what is a good stain. Is Cabot good? Sikkens? TWP? If you could advice me I would appreciate it. Also, can I sand and then wait to put on a cleaner. I have a clear day possibly tomorrow and then it looks like rain for the next 5 days. 84Golf, have your tried a stain stripper? That usually works better then sanding and takes less time. Brighteners are used to lighten the wood and neutralize a cleaner or stain stripper. TWP is better then the other 2.
i see you like TWP (is that the 1500 version?) and how about Armstrong Clark’s Semi- Solid? would you say that rates up there with TWP? Yes the AC is very good like the TWP.